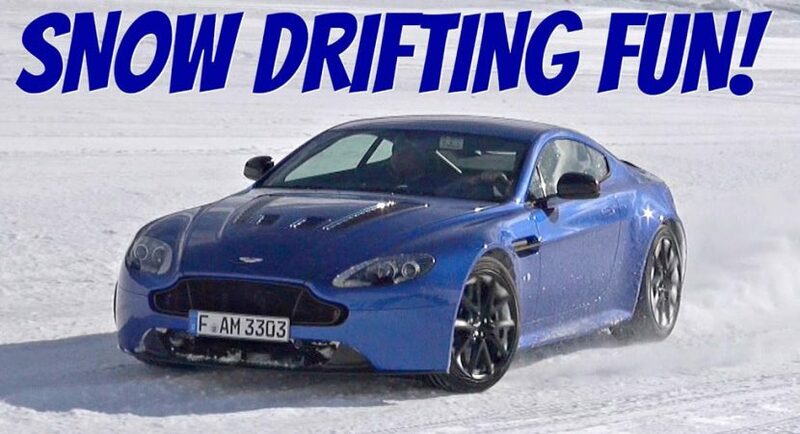 In case you doubt the drifting capabilities of a massive sports car like the Aston Martin V12 Vantage S – which is by the way one the most powerful Aston Martins ever created – then you should take a look at the video below, which is showcasing such a doubtful possibility. And while some carmakers are downsizing the powertrains of their sports car for increase downforce, others remain faithful and want to keep things as simple as they can. I mean, what is the fun of a drifting session if you can`t do it with a massive engine underneath your heavy model, as the Vantage S is right now! Even so, the challenge is serious, but the Brits know their business. To understand the sheer force of this brute, we have to have a short look at the car, which is, by the way, much faster than a Lamborghini Huracan (330 km/h on board), coming as well with an impressive acceleration. The 2017 Aston Martin V12 Vantage S packs a massive 6.0-liter V12 engine, capable of producing 565 horsepower and 620 Nm of torque, enough to deliver a sprint from 0 to 100 km/h in a mind-blowing 3.7 seconds, at a top speed of 330 km/h, and that despite the fact that it weighs 189 kg more than the Huracan. In case we made you curious enough and want to see it in action, then just grab a beer, close the door, up the volume and hit the play button! You are about to be blown-away! Also, don’t forget to let us know if you were impressed or not! I was!